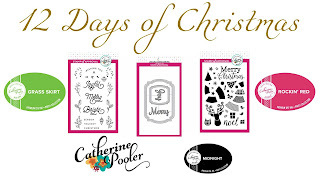 Justine's Cardmaking: 12 Days of Christmas *Day 2* Catherine Pooler Giveaway! 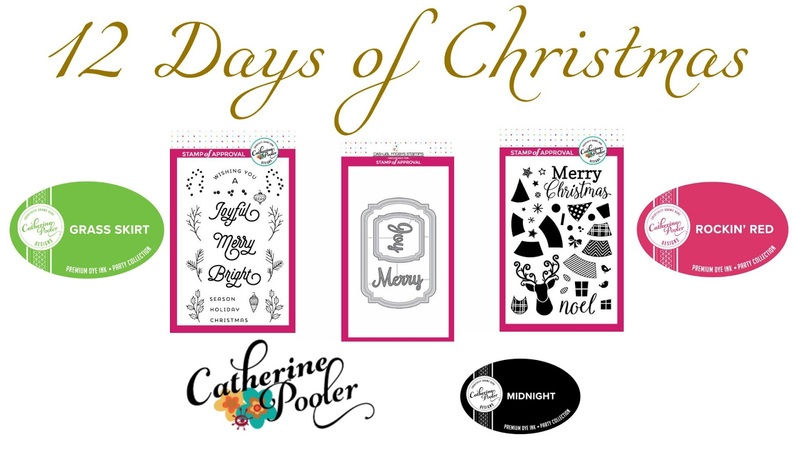 12 Days of Christmas *Day 2* Catherine Pooler Giveaway! welcome back to the 12 Days of Christmas 2017 series! If you happened to have missed yesterday's card and video hop, you can click here to go back and see it! Today I wanted to show off some cards that anyone can make as bulk cards this holiday season using some traditional Christmas colours - red, green and white. Today's giveaway is fantastic and something you don't want to miss - 2 Stamps, 1 Die set, 3 Inks and a Large Block from Catherine Pooler Designs - Thank you for sponsoring today's prize! There are many ways you can create cards with traditional colours! I used the same three colours to create all three cards and create a colour palette. I stamped a few backgrounds using the Peppermint Stick Background in Rockin' Red and used the background in various ways to add some colour to the cards. Stamping some simple holiday words onto a pretty die can be quick and easy but it is so elegant as shown using the Merry and Bright Boughs set. Christmas cards don't need to be complicated. Catherine's inks make it so easy as well because they just stamp so well! No splotches or white patches here! There is something about wreaths that make the season so festive and with the Merry and Bright Boughs set you can create your own. Consider adding some Nuvo Drops to add some texture or simply stamp the berries in red. There are little ways to make cards more interesting and Nuvo drops are some of my favourite ways to add a pop of colour. For the last card, I created a cluster of small stamps from the Hip Holiday stamp set in order to create a whimsical, starry background. I added the stag to the front of the card in black which is a very bold way to add a focal point. I live the peppermint stick background too!!! It is perfect for Christmas but I can see the possibilities for all through the year as well! I might just have to buy it one day soon!!! I love the traditional colors of red and green for Christmas decorating! Super cute cards. I love he leaf and berry elements! Lately I have been using pink, teal, purple and grey for my holiday cards. I'm trying to do more non-traditional colors as of late. Just watched today's video, love the festive cards. Beautiful cards, love these traditional vibrant colors and thanks for sharing the inside of the cards and envelopes! Another great collection of cards. Loving that stripe. You are always a inspiration Justine. I already have this collection and now I have more ideas to use, thank You! I love Catherine Pooler inks, Can't wait until the new colors are released in November. Beautiful cards! I have been wanting to try Catherine's inks! I use a lot of traditional red and green, but I also love aqua,white and red. Beautifully simple cards! I love that Peppermint Stick background. So pretty. I especially love the simple wreath!! These cards are amazing. Very versatile product. I love love love - going through my stash to see what I have and what I should purchase. I've enjoyed Catherine Poolers stamp collaborations in the past. Love Christmas stamps - and how simple and elegant your cards are. 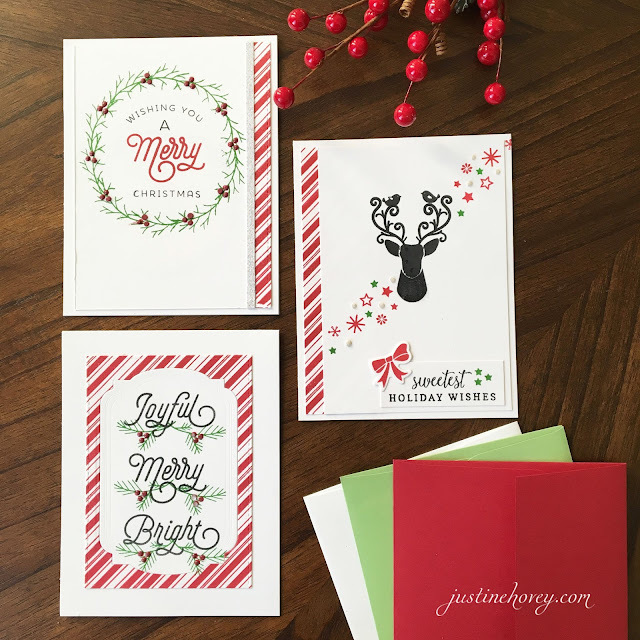 I enjoyed watching you create these lovely Christmas cards, as as always, I love seeing Catherine's products used! I'd love to win the giveaway! I am enjoying your 12 Days of Christmas. Great cards. I typically use red and green, but I think this year I will try some new colors like blues and silvers. Thank you for sharing. I like the traditional red and green. But I also like blue Christmas colors. Love your cards! I normally use Red, Red, Red.. oh and I pop in some white and green occasionally! I would like to use some grey and blue though! Every year I tell myself I am going to try non-traditional colors on my holiday cards, but I usually end up with red and green, or blue and silver on snowy/snowflake cards. The cards are really nice and very Christmasy. They look like fun to make and the Catherine Pooler products are wonderful for these. Love the classic red and green! I love your deer/moose card with the stars and snowflake accents. These cards are wonderful! I love using red - it whispers Christmas to me! You're really selling me on the Catherine pooler inks. Super cute use of these supplies. I missed her SOA last winter and I love these items! Gorgeous wreath card - that's my fave. And I tend to use 99% traditional colors (red and green) but throw in some silver and gold along the way. Maybe they are considered traditional too? Rarely anything else. Thanks for the inspiration! I love Catherine's products. Love these cards, the traditional colors and simplicity of design, I think this may be the direction of my cards this season! I like and make traditional colored Christmas cards! great inspiration! I am tending to use lots of silver and gold his year. I'm new to your blog and cards! These are gorgeous and so simple to make!! Massive typo, I adore the candy cane stripes on these. I love your clean and simple cards. Would love to win these stamp sets. Keep up the good work. Beautiful cards! I’m usually a traditionalist, but I saw a card with turquoise and purple that was stunning, the other day. Don’t know if I would do it, but it was gorgeous. I love the traditional colors: red,green, silver and gold. I just discovered Catherine Pooler recently. I fell in love with some cards I saw made with the Winterhaven collection. I would love to try out her stamps and dies. These cards are so pretty! She has amazing videos on you tube! Thanks! Thanks so much for a chance to win, and for another great video! Have a blessed day! Wow, such gorgeous cards! I'm loving the classic clean look! This year i'm in to using blues and silver. Wonderful cards Justine! Thanks for sharing! Thanks for chances to win. You are so talented. I love traditional bright reds and greens! These cards are right up my alley! I love the peppermint background. Colors I like to use on Christmas cards are green, yellow/gold, red, blue & some shade purple, silver & white. Thank you for a fun hop & the giveaways are fun too. I tend to use traditional colors about 40% & Blues and silver for most of my cards. fantastic cards! for Christmas creations I love the traditional colors..red green black and gold..
Love this series! I tend to use traditional colors at Christmas time. I love all your cards and I especially liked the envelope. Great job as always! I love the simplicity of these. Especially the peppermint stripe background--I could totally go to town with that one! I do use some non-traditional colors, but I always come back to red, white, and green. A little gold or black go a long way for accent. I use a different color theme each year...black and gold, white and silver, red and white. This year you have inspired me to use the traditional red, green and white. Candy cane collection the absolute best! I love the use of matching envelope that you did - how clever and can't wait to try it! Looking forward to trying the inks! Love your cards! I like simple cards but I have done a lot on cards also. Love the candy stripe stamp too. Thanks for sharing and letting us see cool cards. Love seeing Catherine Pooler products also! Thanks Justine and Catherine. I like to use traditional red and green or blue and silver for my holiday cards. Love everyone of your cards! Those stamps and inks are really awesome! You are so inspiring! I love using golds, silvers, whites and glitters - keeping it classic and traditional! What wonderful cards using these great Catherine Pooler items!! I wasn't sure I wanted the set, but now I am LOL! My Christmas cards end up using a lot of snowflakes (I have a thing for snowflakes) so my cards usually end up in shades of blue with silver. Although I do love a good traditional coloured card and even non-traditional cards! Beautiful stamp sets...lovely cards! Thank you for sharing! Such festival, lovely, and easy to make cards. Love background stamps like this. I tend to love red, green, gold. But I'm starting to lean toward pink, red, greens. Thanks for sharing. Love the stamps. 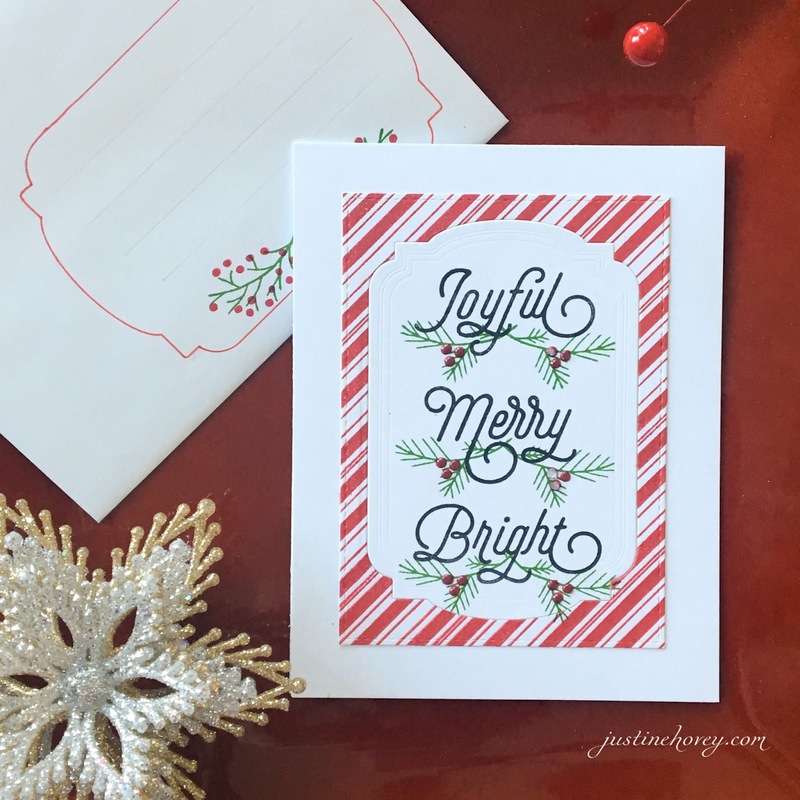 I love to use the traditional colors on my Christmas cards so these are great. Gorgeous cards and what a great prize from Catherine Pooler! I seem to be a huge fan of dark blue and tan for Christmas cards, I make them every year. However this year, I'm using traditional Christmas colors, red and green with a shimmery gold card base and a stamped image, colored in red and green with gold accents. Great cards!!! I love all the SOA products!!! I'm pretty traditional but I like fun stamps..but still the red and green. Like animals over flowers. I loved your reindeer card, for instance. Great stamp set. Love the colors and simplicity of these cards! Great job! I am a traditionalist when it comes to Christmas colors, red green and white or clear with some silver and/or gold for sparkle. I love the Candy Cane all over stamp you used in creative ways. The Catherine Pooler stamps and ink are great! Love traditional colors and these cards, but I do tend to make a variety of cards using different colors! Another great video today, Justine. You gave us some great samples using Catherine's stamps and inks. I love to used red and green, blue and silver and pink and green. Thanks for the great christmas card ideas! I love Catherine Pooler's products! Your series is off to a fab start. Thanks for sharing so many ideas with us! I tend to go with the traditional colours of red and green with some gold or silver but the last couple of years I tried turquoise and red (with a little silver) and really liked this fresh colour combo. I love these cards! I think the reindeer is my favorite! I love using traditional greens, reds, and some non-traditional colors like teal. Thank you to Catherine Pooler for this amazing giveaway! I love these cards. They are simple, crisp and clean. The green and red used are my favourite for Christmas. I prefer traditional red and green colours but every so often I like to add soft pinks and blues for something different. Beautiful cards! The colors depends on who I am making the card for. Great cards! I am a traditionalist! I use reds and greens in the traditional shades. I also like a dark blue with white, silver or gold. Great, great job. I love all three cards and your ideas for the inside and the envelopes are terrific. Thank you for inspiring me to create some Christmas cards today! Your projects turned out beautiful!! I am a traditionalist...red, green, white. But I do like to go outside of my box sometimes too!! Justine, your cards are great! They're giving me ideas for the Christmas stamp club swap! Thanks so much for all your inspiration pieces! These are beautiful cards as always Justine! I love how you used the traditional colors of Christmas and created such modern and elegant cards! And what a generous give away! And this year, I’m all about the reds and green plaids! These cards are amazing!! This year I think I am about more pastel colors. Love the cards you made for us. The candy stripe Rockin' Red cardstock was awesome! Love the ability to replicate such elegant and fun cards. Thanks! Thanks for sharing more card sets. I am really trying to make at least 3 of any design that I come up with. I love the traditional colors the best with a rustic theme as my second favorite. Thanks for sharing. Love these cards they are amazing and simple to do. Thanks for sharing! Love the fun cards! So 50's and fun. Thank you for the inspiration. I really enjoy the bright pops of red along with an almost lime green color. Plus a little silver and gold on some. Great designs. I love the background stamp that you used on these! Beautiful cards today! I like traditional colors, but also turquoise, navy, and silver.... especially with snow. Love, love, love these designs and colors. Basically, love all things CP. I'm newer to the products, but can't get enough. Thank you for the inspiration. Lovely cards and what an amazing prize package!!! Would love to win. I love these cards! It's always hard for me to pick colors for Christmas because I love them all! I can never decide between Red and Green,or Red and Gold,or Gold and White or Silver and White. Then there's Blue and White and now Black and White...it's too difficult!! Wonderful cards, I love their simplicity and beauty. I love the cards. Simple and beautiful. Beautiful CAS card Justine, love watching your videos! I love these designs! I tend to stick to traditional colors for Christmas cards, and I love adding gold embossing accents! I just love the traditional red, white and green colors. Your ares are amazing. They seem to bring me right back to my childhood. Thank you so much for sharing them with us. Thank you for your wonderful video! Love your cards. I am an expert at making mistakes. Great fix! I also love the red and green colors. I love the peppermint background stamp. That is just beautiful. I like using traditional Christmas colors with a little sparkle! I love using red and silver or red and gold! I love how you decorated the envelope to match the card! Your cards and a Catherine Pooler’s design are so elegant, yet simple! Love those cards. You have provided us with a lot of inspiration. I use darn near every color of the rainbow and then some! All depends on the stamps/dies I'm using and the recipient. Since I rarely make multiples I can customize. I like traditional red and green Christmas colors. These are just beautiful Justine! I really like the wreath. I enjoy traditional red and green colors for Christmas but I also love blue and silver too!! I like pastels and Gold! Wow yu made those simple little images rock. I struggle with small images but love what you did with them. What great cards! Thanks for all of the inspiration! Your cards are so beautiful. As for the colors I use for my Christmas creations, it all depends on the theme/design of the card but usually the card base is either red, green or white. This is such a fun card kit. I can’t believe how many possibilities exist with just one kit. Would love to add it to my stash! Great cards! I like traditional Christmas colors but adding gold and silver is great too! Adorable retro cards..Silver and blues..
Beautiful and classic cards, love the traditional colors you used! I tend to use a lot of purples and blues in my holiday cards. Love these cards and ideas. I like to use traditional reds and green but I also have a weakness for blues and silver. Thanks for the great ideas! Thank you for sharing with beautiful cards. I love Red,Gold, Green and Silver Colors. I like traditional colors. Love your cards! I like matching red and gold and blue and silver :) Lovely cards! I really like the red white and green decorations on the reindeer card! Absolutely love these cards!!! My favorite was the wreath one. Never thought to make a circle first...great idea!!! TFS!! Love these cards in the tranditional colors. The stamps are awesome and would go rather well with my holiday collection!! Fantastic video and great intro to Catherine Pooler! I love the stamp sets and feel I must try her inks for solid stamping. And, I am all over the place for Christmas colors myself. Cranberry red, evergreen, gold and silver. But also shades of icy blues and winter white, too. Thanks for such an informative video and how very gracious of Catherine Pooler to offer up such a great prize. Thank goodness Catherine posted this on my IG feed! I don't know why I didn't follow you during Winterhaven! These cards are beautiful, and I do like simple. Thanks to you and Catherine for the giveaway. I love traditional Christmas colours, red, green, silver, and gold. I love to use the classic red and green. I tend to use classics: red and green, and then gold, white and blue. Love the cards that you made. 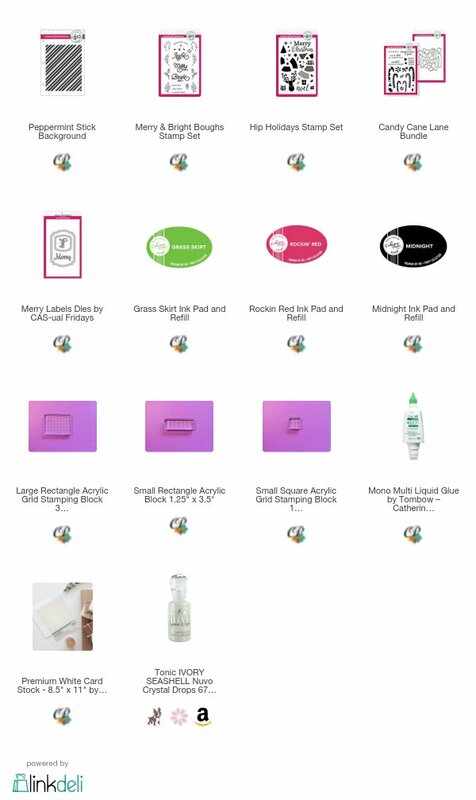 I am very familiar with Catherine Pooler and have bought a lot of the Stamp of approval sets, this set however I didn't buy so would love to win it instead! Awesome cards, Justine! Love the wreath one especially. So elegant! O tend to use a lot of blue, white & silver on my cards, as I was enamored with snowflakes for a while. Great cards, I have no set colors for Christmas cards it just depends on the stamps and what I am making at the time. I love these cards and I love the traditional colors. These stamps are awesome. I just took a look at the cards I've made so far for Christmas and they are all a mix of different color combos. I love them all. I love traditional colors of red and green. It depends on what stamps I use as to what color of ink I use. I love the wreath card you made here! Gorgeous cards! Love the Catherine Pooler designs too!! I like to use non-traditional colors in greens and red for my cards. As I said under your video, I love watching them because I learn a lot of new things! These three cards are so simple but full of beautiful details! Love how you made the wreath! I like to use traditional Christmas colors for my Christmas creations like green, red and golden but I'm planning to use unconventional colors this year like pink and blue! Great cards. Mostly I use traditional colors but a couple years ago Bo Bunny had a great linevwith soft pinks blues creams yellows and mint that I fell in love with. Best cards ever. Great Video! So important to use minimal supplies when mass producing cards and yet doesn’t limit the beautiful end result! These cards are Fantastic!! I hope I am not too late posting I am new to this type of contest. Thank you for sharing this it is amazing. Oh, wow...you are a great stamper/card maker!!! Your cards are so beautiful! I really love the peppermint stick background stamp :) I typically use traditional colors for Christmas - reds and greens. But, I also like using blues for a more wintery look as well. Love either very bright with a lime green or very rich dark green and red with purple and gold. I love these quick, simple card ideas! Thanks for inspiring me to try to keep it simple! Usually I use red and green. Sometime I would also love to use blue and white as the snowing theme!! I love the traditional red and green and have used in years past but find I have been using non traditional colors lately. This year I am using gray and pink! Red and white are so traditional that I find myself bored with them - unless you use them as you have here - as accent colours to a simple card. I really like blue and white, if I'm going for a full colour card! Clean simple and elegant. Beautiful cards. I like the traditional red and green. i love traditional red, white, green, with blue and white for snowmen. These are beautiful! Your cards made me want to win this and create my cards for this Christmas. I love what you’ve done! 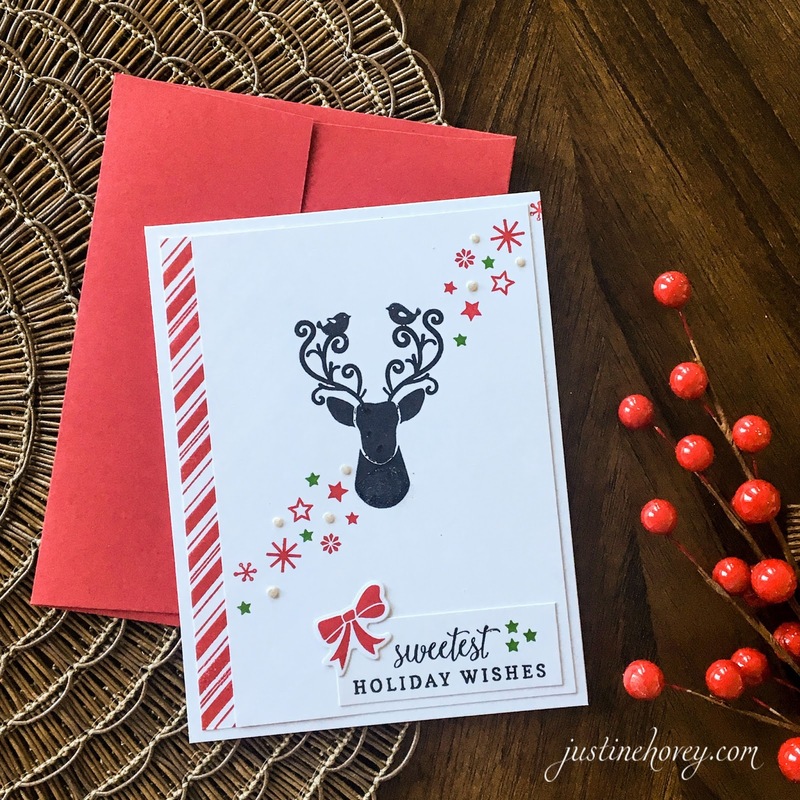 Love your sweet Christmas cards, and the great giveaway prize!